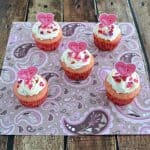 Looking for an easy but delicious Valentine’s Day treat that the kids will love? Look no further! 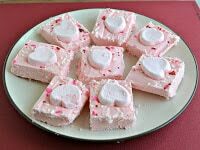 This strawberry fudge has only 2 ingredients plus decorations and whips up in under 10 minutes. It tastes great and it’s easy to customize with different toppings. I made 2 batches of this fudge and the first one was gone before I got a picture. I topped the first one with chocolate jimmies and chocolate dipped mini marshmallows. They were delicious! 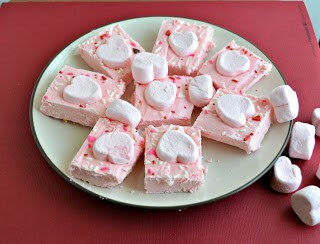 The ones I got the picture of have Valentine’s Day sprinkles on them and heart shaped marshmallows. I served these to the kids at school and they were asking me for the recipe! I printed it out and sent it home with them since it’s such an easy one and they could make it at home with parental supervision. 1. Spray an 11 x 7 pan (or 9 x 9) with cooking spray. 2. Heat the white chocolate in a double boiler, stirring frequently until it is melted. 3. Remove the chocolate from the heat and stir in the strawberry frosting. 4. Spread the fudge into the prepared pan and smooth it down. 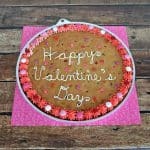 Sprinkle with sprinkles and any additional decorations. 5. Place in the refrigerator for at least 1 hour. **Store in an airtight container in the refrigerator for up to 1 week. This is great – especially since it is only 2 ingredients! I’ll have to make this with my daughter soon.